This pure work of art is written in form of a lyric poem - defined as emotional and song-like, originally accompanied by a lyre when spoken or sung. "A warm-hearted, lyrical book about the limitlessness of love." The "limitlessness" of love is probably something everyone could use a reminder about every so often, and what better way than through a simple song accompanied by touching, adorable, and colourful art? It was released a couple of years ago but I hadn't seen it on the shelf until today, and as soon as I did I had to pick it up. Childish or not, the simplicity of the words and the pure, bare truth in them draws you in and is a warming, comforting reminder that you are loved - fully, truly, warmly, and glamorously - and it is a striking and beautiful thing. The perfect book to raise your spirits on a dreary, no good, very bad day, because we all have those, sometimes all too often. "My life is a mess. After forty-five years of trying to follow Jesus, I keep losing him in the crowded busyness of my life. I know Jesus is there, somewhere, but it's difficult to make him out in the haze of everyday life. I want to be a good person. I don't want to fail. I want to learn from my mistakes, rid myself of distractions, and run into the arms of Jesus. Most of the time, however, I feel like I am running away from Jesus into the arms of my own clutteredness." From page one (or rather, page 18, where he begins to share after the foreword written by his wife, Karla), Michael Yaconelli is brutally honest about himself. And, to a point, about the reader. 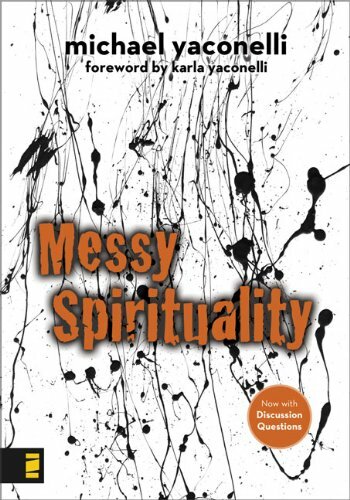 The premise of Messy Spirituality is based on the foundation that it is relatable. No matter what stage you are at in your faith, it can seem like not enough. You're not spiritual enough, not committed enough; you don't have enough faith, you don't love God enough, you don't share your faith enough, you don't pray enough, you don't read your Bible enough. Everyone tries to measure up to everyone else in a detrimental spiral of comparison and shame, and in the end there is no pay off, because faith is a personal thing. You cannot compare. Yaconelli suggests that maybe faith "begins with admitting we will never have our act completely together". He addresses spiritual perfectionism as a common struggle, and Messy Spirituality provides thoughts to help change those habits. The growth of your faith is something between you and God, and God sees everyone as they are: messy, imperfect, and absolutely beloved. Pastors, missionaries, worship leaders - they all struggle with the temptations and the doubts of everyday life as much as the next individual. Your position, your profession, your calling - does not determine the level of your faith. Yaconelli offers encouragement, to those of us who feel like we are not enough. He provides assurance and a sense of direction. He does not necessarily say that your faith doesn't need some work - that would be untrue for anyone, at any point in time - but he wants to remind anyone and everyone who have all somehow forgotten that faith and spirituality are not neat, clear, clean, or straight forward. Not always. Not for everyone. It is a constant, lifelong struggle; a work continually in progress. And that can be a very comforting thought. For a fall into the realm of the fantastic - in the root, literal sense of the word - Anna Thayer brings us the epic trilogy of The Knight of Eldaran. "I just started reading The Traitor’s Heir, the first book in the The Knight of Eldaran trilogy by Anna Thayer, and I’m hooked. I’m impressed by Anna Thayer, who is not only a Tolkien and C.S. Lewis scholar, but a great writer as well as she sustains tension and intrigue throughout this well-woven and ever-unfolding tale. The Broken Blade, which came out last month, completes the series, and although I’m sorry I hadn’t heard of them sooner, I’m happy to be able to read them all without suffering the wait between volumes. I think anyone who has enjoyed Stephen Lawhead will appreciate this epic series." Followed by The King's Hand and then the final installment, The Broken Blade, Thayer's The Traitor's Heir follows the story of Eamon Goodman and his transition into the ranks of the Gauntlet: the army of the overlord Eldered. Through her use of tension and captivating suspense, Thayer creates this epic and provides a cast of strong characters with developed relationships to keep you coming back for answers. 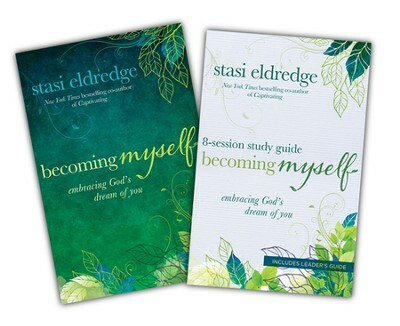 Stasi Eldredge has the unique and cultivated perspective of a woman who is learning to give thanks and praise to God through her sufferings and pain. It is a simple thing to thank God when everything seems to be exactly as you want it - a simple thing to praise God for the good in your life, in smooth sailing. But when the storm hits, that thanks and that praise is all too easy to forget. We turn to anger. It is a simple thing to blame God. He's in control of everything, isn't he? He knows what will happen before it does - he is outside of time. This is all true and good. But it does not mean that he thrusts suffering upon us. And this is only one of the many issues that Stasi Eldredge covers in her book, Becoming Myself. Letting go of the blame we have for God in times of trial is one of the crucial elements of drawing closer to him, and in that closeness it is only natural for us to be more of who we were meant to be. The art of becoming oneself is a longer, harder, much more arduous road than one might imagine. Why is there so much that gets in the way? Why do we have to fight so hard? These are not baseless questions. And they don't have to go without answers. Why are you struggling with the things you do? There is a reason. It is found in the life you have lived, the wounds you have received, what you have come to believe about yourself because of them, and not having a clue how to bear your sorrow. It is also because of who you are meant to be. It is not too late. It is not too hard. You are not too much. God's mercies are new every morning. There is mercy in his eyes even now. Stasi's assurances are written powerfully. Simply. Truthfully. Her voice carries the gentle tone of understanding and caring that can be hard to find even with the closest of friends, without the feeling of the figurative pat on the head and the sound of the condescending tone that is sometimes too easy to hear. She draws you in, builds you up, and hands you the strategies to stay there on a pinnacle of confidence. That is not to say that you will stay there. That is not to say that the hard times won't be too hard any more. But taking the time to hear what she's saying, and taking her words to heart, does make it easier to come back from those hard times. Even if it's only by a little bit. It is worth it. You are worth it. And that, ultimately, is what she wants you to know. What if I opened the clenched hands wide to receive all that is? A life that receives all of God in this moment? How do you do that when terror tears up your throat and you wear the burn scars of a razed past? Chapter 8: How will he not also? As Brittany will share with you, the cover of this book is not the only thing that makes it so attractive. But the cover does call to me, in a way. Which, naturally, means that I know I'm going to end up reading it one of these days. That is, once I get through all of those other books whose covers drew me to them. They say to never judge a book by its cover, but don't we do it anyways? An aesthetically pleasing cover could be the tipping point between intrigue and desire. 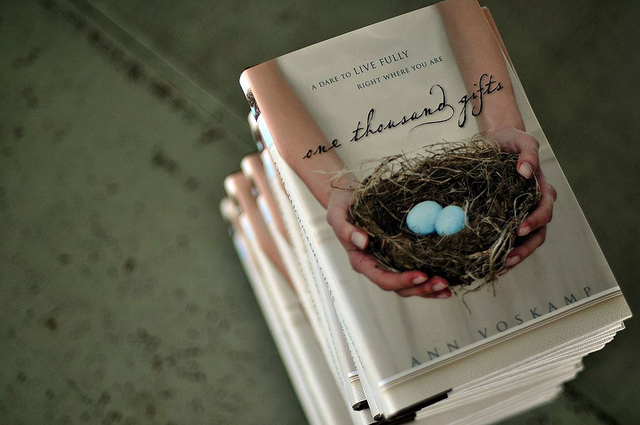 I recently stumbled across "One Thousand Gifts" by Ann Voskamp. From first glance the cover intrigued me, and as I began to flip through the first chapter, I couldn't put it down. I wanted to take in as much as I possibly could. At the same time I longed to digest it slowly, savouring each word. As I read, I stepped into her world and my heart was quieted. Words of gentle grace and a profound understanding of the gifts of God permeated each page. Ann guides her readers through her journey of discovering gratitude, and the power of truly giving thanks to God. She spoke openly of her struggles and pain, and I gained respect for her quiet wisdom. She challenges her readers to lay aside their pride, and embrace surrender to the Lord who lives and loves, who gives good gifts and hears the anguished whispers of broken hearts. Life can be hard, and souls can feel broken, but "One Thousand Gifts" guides you into the deepest truths of God's love, where his goodness overflows, and thanks is the only response your heart can make. Ann's writing style is engaging and gripping, even in the few pages that I have read. Once you start, it will be hard to stop. And if you're anything like me, that's probably exactly what you want to hear. 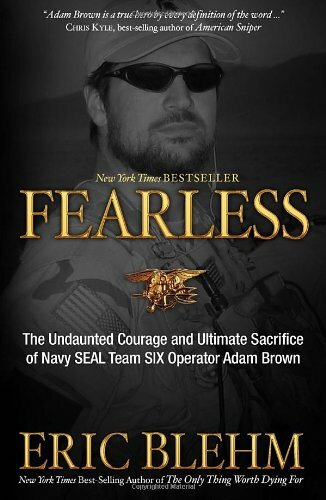 For someone who is far from fearless, this should prove to be an interesting introduction of sorts for me. My name is Elise, and I will be looking after this dear blog for a little while, hopefully conveying my love for blogging, books, and words, through the vast and wavering realm of the web. "God gave me a gift. I don't feel fear." And just for the record, you need have no fear about coming in to see us at our store on Emerson St. Honestly, how intimidating could a bunch of booksellers and book lovers possibly be?